The use of “sea salt” has skyrocketed; I’ve even noticed it myself. I kept thinking, “What’s going on, did it become very cheap to get the water out of the sea salt to make it worth selling sea salt?” My mind was just groping for some sort of answer. The food industry is asking the same question as I am. I was wanting to know because of the health implications, but they want to know whether it’s the ‘natural’ trend, the ‘healthy’ trend or the ‘premium’ trend, or some combination of the three; so they will know specifically, who to market the sea salt to. They would like us to forget that humankind has always used salt that originated in a sea (either ocean or inland sea like the Great Salt Lake). The saline water dissolved and deposits were left, naturally. Nutritionists, not just me, are trying to help the public find ways to make food taste good with less sodium, so the increase in sea salt was not making any sense to me. I know that the public is beginning to recognize the problem of too much sodium in the diet. I think that some people may have the idea that sea salt is natural and extra healthy and maybe they believe that the sodium in sea salt does not lead to the deleterious effects of regular table salt. Or maybe some believe that the trace minerals found in sea salt are removed by processing and these produce special benefits so great that the sodium in sea salt, eaten in excess as we do, is somehow made healthy. Yes, it’s true that salt is a vital mineral for human life (muscles, including the heart muscle and nerves need sodium to function – all kinds of things would go wrong in a body without sodium); but unfortunately, the western diet provides between 10 and 12 grams a day (10,000 to 12,000 milligrams). Most healthy adults need just a couple hundred milligrams of sodium per day. Health professional, including me, are trying to help the public reduce their intake and keep it under 2 grams per day. One-teaspoon table salt, sodium chloride is 6,200 mg; of which 2,300 milligrams is sodium. Many health organizations are trying to guide people to keep their sodium intake between 1,500 to 2,300 milligrams per day (1 teaspoon of salt maximum). I’m going to write more about salt and replacing salt in cooking, but for now I just want to address this sea salt issue. It seems that people have somehow gotten the idea that sea salt is better than regular table salt, because of subtle differences such as more trace minerals in sea salt; although the minerals are generously and readily available in regular food. Some of the ‘sea salt’ suppliers claim that processing the salt takes out good things and adds in bad things like anti-caking agents I’ve not heard of any deleterious effects of the trace amounts of anti-caking agents; I think that calcium silicate is one of the most common substances used, but I’ll have to save that for a post on another day. Just because it comes from the modern sea does not make it healthier, salt, whether it is sea salt, Kosher salt, or ordinary table salt, it is sodium chloride and ……something like Gertrude Stein’s “A rose, is a rose is a rose”. Salt, is salt, is salt! Beware! There is no difference in the health effects influenced by excess salt (hypertension, stroke, osteoporosis and so on.) If your doctor (or your common sense tell you that the western diet is giving your body too much sodium, don’t think that sea salt and kosher salt are the answer – they’re just a different rose. Dr. Grandpa and I saw a documentary on the mining of salt below the Great Lakes, specifically below Detroit. That mine is the remains of an ancient (400 million year-old) sea that has since been covered over by sedimentary layers. This question begs an answer, “Is the sea salt (regular table salt that comes from ancient dried up seas) better, than if it comes from an exposed dried up sea, like the Great Salt Lake, or right out of the modern ocean? I know the answer as related to sodium chloride – what makes the food salty and what makes too much potentially cause health problems – the answer is that it doesn’t really matter how many eons ago your salt was deposited in the bottom of a sea. What matters is eating too much of it. OK, you can find people on the internet and in books claiming that the tons of earth pressing down on these deposits of old “sea salt” change the surface crystalline structure and take away the magic they claim. Their scientific evidence for these differences is slim or non-existent. These sites are always full of links to purchase sea salt with the supposed magical properties that old salt, (also from earlier, more pristine and unpolluted seas), supposedly lacks. Not unlike nutritional supplements or special exotic fruit juices, this wondrous newly minted sea salt is much more expensive than the deposited salt humans have been eating for millennia. Until better research shows that “surface crystalline structure”, trace minerals, harsh processing, or other subtle differences between new and old sea salt matter, the fact is that the American Diet contains 500%-600% too much salt. Avoid junk foods and restaurant foods loaded with salt and fat, and get the amount of sodium you consume down to a healthy level. Use new, expensive sea salt if you have the spare money to entertain unproven fancies, just get the amount of sodium down to a healthy level. 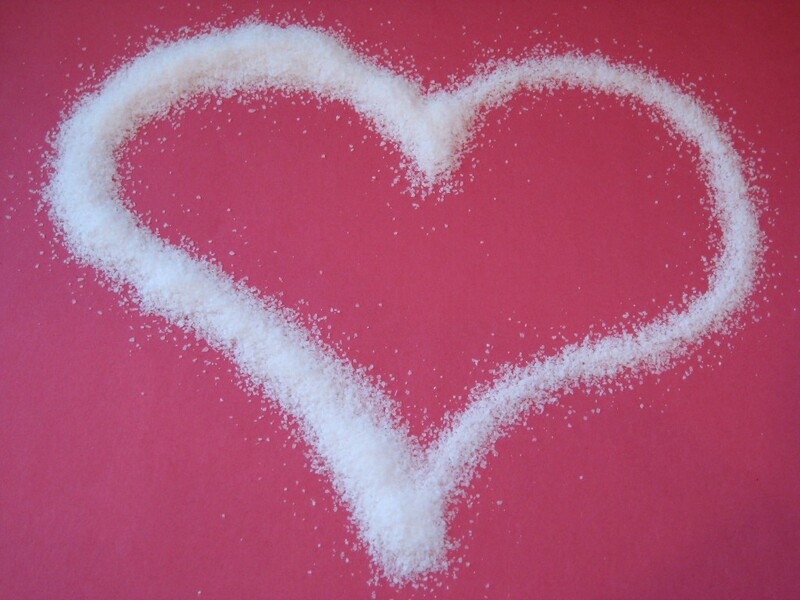 Remember your heart when you choose salty foods - It's Heart Health Month. 2 responses to How Ancient Is Your Sea Salt? The question I always receive is whether sea salt has less sodium and whether it contains iodine. Do you think we still need to choose iodized salt over non-iodized versions? And if the sea salt crystals are smaller do you think maybe we will need less salt on the food? I know the recommendation is to not add salt at all, but most people do. So –what do you use? Sea salt generally has minute amounts of iodine found naturally in the salt. Sea salt does not contain less sodium than regular mined table salt. People generally choose sea salt because of the texture options and slight difference in the taste. Unless the salt is on the surface of a fairly bland food, it would be difficult to taste the difference. I strive to use a fairly small amount of salt, so I don’t find the extra expense of sea salt to be worth the investment. In addition, I frequently cook with lots of herbs and spices, which would drown out the delicate difference the sea salt makes. I do believe if the salt crystals are very small that may equate to a lower intake of sodium – that’s a great point. The crystal size is one of the reasons that I rarely use kosher salt – I use it on a few recipes, where it is mostly removed after cooking. Your issue regarding the recommendations of not adding salt is intriguing. This is my personal opinion: If you’re eating at a restaurant or fast food and the salt is included…. Oh I should have written that in capitals …. the salt is INCLUDED. Then maybe don’t add any salt. When you’re cooking at home, I believe in adding salt sparingly. I’ve cooked lots in my life and have tried to cook low sodium, but I must admit, many foods with no salt are…… well, dull. I’m actually concerned that families that are trying to move away from restaurants and fast foods and don’t add any salt are going to think the cook can’t make good food. Many food items just need some salt. Did you get a chance to see the picture of the teaspoons of salt? It was in the blog http://www.doctorgrandmas.com/library/blogs/dr-grandma/2010/03/01/a-pinch-of-salt-can-do-the-job/ It was called ‘A pinch of salt can do the job’ posted on March 1st. It is hard for me to imagine a cook adding the five or six teaspoons that those eating at fast food and restaurant establishments are getting – that’s per person. I really wonder if the reason that so many people don’t like vegetables is that there is not a touch of salt or butter on their steamed vegetables. This is probably an ‘old grandma’ idea; but it works for me: When in question, add less salt than you think it needs – you can almost always recover from too little salt – but too much is a big problem. My recipes are usually fairly low in sodium, but on many recipes, you can decrease the sodium. Best wishes for a beautiful weekend – we just shoveled a foot of snow today – Mountain West is white today (16 days before spring).